Try this easy fusible web applique quilt patterb if you've always wanted to try applique but were a bit hesitant to start. Fusible web makes the project a breeze, especially when you work with curved shapes. The quilt finishes at 24-1/2" square, just right for a small wallhanging or a throw pillow cover. 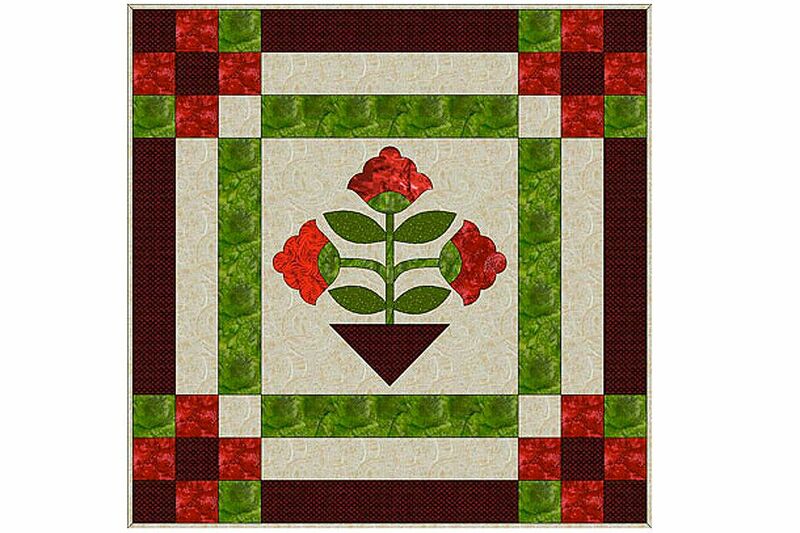 You can also use the project as a center medallion for a larger quilt, adding borders and other components around it to increase its size. If you prefer, use traditional needleturn applique, Or try any other method, including sew and turn applique. What Is Fusible Web Appliqué? Fusible web is a product that's sticky on one side when ironed but backed by a rigid substance on its reverse side. The rigid non-sticky side can easily be marked with pencils or pens before cutting out shapes. The thin webbing becomes sticky and adheres to fabric when it is heated with an iron. There's no need to turn under patch edges when you use fusible web, and for wallhangings that may never be washed, or are carefully hand washed, you may not need to add finishing stitches around the edges of each patch. If you're making a quilt that will be washed, reinforce patch edges with hand or machine stitching to keep them from fraying. Some types of fusible web claim that patch edges needn't be reinforced, but do it anyway, for security and because stitches add an extra design element to the project. Leaves: one piece, about 4-1/2" x 8"
Stems & flower bases, about 5" x 11"
Basket, one piece about 4" x 6-1/2"
An iron and scissors are essential. Remaining items listed below are helpful. Read a few tips on page 4 before you begin. Draw designs on the paper side of fusible web. When shapes are cut out, that side will end up on the reverse side of our patches, making them mirror images of the originally tracing. That's not important for symmetrical motifs, but it's critical for directional and asymmetrical patches. If the concept sounds confusing, don't worry, you'll understand after you cut a few shapes -- just keep it in mind for now. Download the floral PDF file and print the templates. Templates are mirror images -so there's no need to change them. Download the block layout guide. Position each printed sheet under the fusible web, paper side up. Trace images onto the paper side of the web. Cut out each shape about 1/4" outward from its traced edge. Place the sticky side of each patch against the reverse side of fabric and fuse by placing an iron on the paper side. Be sure to follow manufacturer's instructions for heat settings. Cut out patches on the traced lines and remove the paper backing. Arrange and center patches on the 14-1/2" background square and fuse, again paying close attention to manufacturer's recommendations. Trim the block to 12-1/2" x 12-1/2", centering the appliqué in the square. Since there aren't too many, we'll assemble the patchwork piece by piece. Take care to align patch edges as you sew. Sew a 2-1/2" wine strip lengthwise to a background strip of the same size. Sew a green strip along the remaining edge of the background strip. Press seam allowances away from the center strip. Repeat to make a total of four identical units. Make a nine patch unit by arranging 2-1/2" x 2-1/2" squares into three rows as shown in the illustration. Sew the squares in each row together. Press seam allowances in all rows towards the red squares. Repeat to make a total of four identical nine-patch units. Assemble the quilt into three rows as shown. Press seam allowances towards the long "striped" units. Sew rows together and press. Mark for quilting if necessary. Sandwich with batting and backing and baste the layers together. Quilt. Carefully trim excess batting and backing. This article contains a few e-commerce links, and we may receive compensation in connection with your purchase of products via the links.